Most of you long time readers are well aware of my dislike for artificial sweeteners. Whether they have been found to drastically alter gut flora (sucralose, in rats), are on the EPA’s new but unfinished list of potentially dangerous chemicals, increase risk of pre-term births and caused cancer in rats (aspartame) I am not a fan. This is especially true since there other options that are not synthetically made in a lab and have been consumed by humans for possibly thousands of years. In this case, we are talking about stevia. Stevia rebaudiana is a plant from South America that is native to Paraguay and has long been used by the indigenous people there to sweeten beverages and make tea. While most of us, myself included, use the word stevia to refer to the sweetener, this is in fact referring to the plant, of which only some components are actually sweet, called steviol glycosides. Mike Robertson has two absolutely fantastic posts asking this exact question. Mike not only covers his own thoughts on the topic, he also interviews one of the leading experts in spine biomechanics as well as two top-notch strength coaches who train MMA fighters, a sport that highly encourages the use of spinal flexion work. It is an engaging 2-part series that is sure to spark some debate, so check it out! After enjoying a delicious cup of clam chowder today while eating lunch with some friends and watching the Patriots lose, I realized I knew little to nothing about the nutrition facts and nutrient density if clams! So I decided to do a little research, and much to my surprise clams are a virtual superfood! Now to be honest I don’t much believe in the notion of “superfoods,” however clams do pack a ton of nutrition into a small package. How much nutrition you ask? Let’s find out. That is a nutrition powerhouse right there! 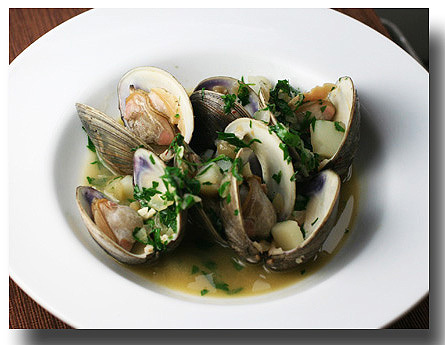 Clams are the best source of vitamin B12 and iron in the entire world! Yes, you read that right. Entire. World. They are also a deliciously lean source of protein, and are clearly rich in a ton of other vitamins and minerals. They are pretty much the multivitamin of the ocean, so feel free to enjoy a delicious cup of clam chowder before the summer is over! In my recent Day in the Life I mentioned how I filter my drinking water with a simple activated carbon faucet filter. I use Culligan to filter my drinking water and shower water, and have had great success with both. At the end of that post a reader asked a question that I thought I could expand on more here. Q. One question,I was thinking about finally investing in a water filter and I saw that you are already using one. Is it really that easy to set up as the ads claim? Also do you have any reliable sources on why we should make the transition? I have read many different things online but I respect your opinion a lot and I would like your suggestion! A. In reality it is very easy to set up; it takes less than 5 minutes all told. 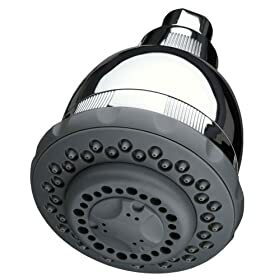 As noted above I have a filter from the same company in my shower as well. While I don’t have research studies to link you to per se, you can read this from the National Resources Defense Council. It will also link you to ways to get your water tested and what you should look for to solve your problems. One big reason we got it was because when my wife got pregnant we were living in a really old house, like turn of the century old, with lead pipes. The lead made me nervous, and an activated carbon filter like the Culligan will remove 99% of lead. How it works : Positively charged and highly absorbent carbon in the filter attracts and traps many impurities. Used in : Countertop, faucet filters and under-the-sink units. Gets rid of : Bad tastes and odors, including chlorine. Standard 53-certified filters also can substantially reduce many hazardous contaminants, including heavy metals such as copper, lead and mercury; disinfection byproducts; parasites such as Giardia and Cryptosporidium ; pesticides; radon; and volatile organic chemicals such as methyl-tert-butyl ether (MTBE), dichlorobenzene and trichloroethylene (TCE). In addition to that it is cheap and makes the water taste better, which is a win win in my book. One last great feature is that buying it from Amazon you can sign up to have the filter automatically sent to you every 2 months (which is how often it needs to be changed), which will save you an additional 15% to Amazon’s already discounted price. Now we are really talking! Today I wanted to write a note to aspiring nutrition students based on my experience in undergrad and some skills that I wished I had taken out of it. Below are but a few examples. In undergrad I was intently focused on learning everything I could on sports nutrition. If it didn’t pertain to protein needs, nutrient timing or supplements, I wasn’t all that interested. I had such intense blinders on that I failed to recognize the importance of so many other skills that were taught in my classes that would help me in my counseling of future clients. I was missing the forest for the trees, the big picture for the specific details that I only cared about. When we had a class on cooking techniques and strategies I bemoaned how “unhealthy” many of the recipes were that we made, not seeing beyond that flaw and recognizing the basic cooking skills I could be developing and then being able to show or describe to future clients. While I am slowly learning many of these things on my own, I should have taken much greater advantage of the opportunity granted to me. I am became a certified food manager and learned all about food safety and proper storage in school, and fortunately I do remember much of those details (and some are just common sense), but at the time I certainly did not recognize its importance to my future work. Who cares about the temperature danger zone when there is a new study on post-workout nutrition! In retrospect I see now how being well-versed in that information can have such a massive impact on community health initiatives, because many people have had little to no education on the topic. While I worked hard to make up for this one, I also did not have much interest in nutrition needs throughout the life cycle. 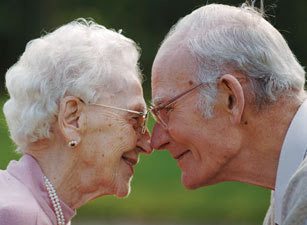 I wasn’t all that interested in how nutrition needs are different when you are 85 (or 6 for that matter). I failed to recognize how this would apply to my future clientele, not realizing that it applies to everyone at some point or another! The point is to not miss the forest for the trees. While it is awesome to have a niche or an area of intense passion and focus, it is imperative not to exclude the many other elements that can impact your ability as an educator, counselor, facilitator. There is a far bigger picture in the real world that so many, or at least I, was not aware of in college. Develop a wide array of skills, you never know what opportunity lay around the corner to put them to work. Today we wrap up my epic series on dairy, providing all of my thoughts on whether you should consume, and if you do, what your best choices would be. Check it out! Today I wanted to touch on a topic that I have been discussing with a lot of people lately. In my mind our current high school curriculum is missing some important life skills that I think would help so many people to function better in the real world. For example, how many of us learned how to budget money, grocery shop and prepare meals, or were taught a thing about taxes in school? These are vital skills that are required to lead a successful life, regardless of career, education level, or socioeconomic status. Yet these skills are left for us to learn outside of school. My parents definitely taught me many of these things, but I still believe I would have benefited from a more structured class setting, as I think most people would. Now I am not suggesting a curriculum overhaul, simply a one semester class. Many high school seniors take two study halls in their final semester, so I simply suggest replacing one of those with this class, or something along those lines. If each semester is approximately 15 weeks long, then it can be broken down into three 5-week units. Unit 1 would be learning about food. We would start with Nutrition 101 – what foods are sources of proteins, carbs and fats – it is amazing how many people do not know this. Emphasizing real, whole, minimally processed foods. It would also teach basic kitchen skills – proper food storage, knife usage, hygiene/sanitation, and food washing. Third would be basic cooking skills. Different cooking methods (baking, broiling, steaming, stir-frying, etc), using a thermometer, following a recipe, etc. Finally I think it would be great if kids were taught how grow their own and shop for food. 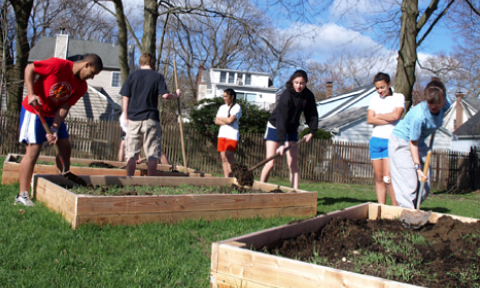 Kids could learn to create a simple garden. Research shows when kids are involved in the growing and cooking of their food, they are much more likely to eat it, especially vegetables. They could also learn a little about composting. Wrapping up the class would be a piece on grocery shopping – teaching them to make a list, shop the perimeter and only pop into the aisles when necessary – its not aimless wandering looking for sales or food that looks good. You would learn how to grow food, shop for food, cook food, store food and a little about nutrition. Not too shabby if you ask me.